This beret is a fine example of the fantasy berets / headgear being made in Vietnam for the tourists. The camo material is not even wartime vintage, it is something the Vietnamese have made. You will see these berets all over Ebay, with very low Buy-It-Now prices. If this was a real camo wartime Special Forces Officer's beret, it would not have a under $50.00 Buy-It-Now price, and the dealer would not have multiples of it. Okay, here is another horrible beret being made in Vietnam. To look at some Ebay / Internet sellers it would make you believe that every beret made in Vietnam had a patch sewn in the interior. In over thirty years of collecting and dealing in Vietnam items, I personally have never had a patch sewn in a beret lining. I have had complete panels with embroidery on them, sewn inside, but never just a single patch. These proposed enemy propaganda cards are some of the worst fakes on the internet today. One thing for sure is these are not vintage at all. The paper quality is nothing the Vietnamese had during the war. Most sellers claim these are from a retired psyops veteran. This is utter BS. The first sign they are bad should be the fact that the photos of the women do not look like they are from the 1960's or 1970's. These are current photos. Look at the hairstyles that should be the first warning bell. Next, the ones that show patch images, are only images you can find in collector patch books. These Tet / Holiday greeting cards are some of he newer paper items coming out of Vietnam. They have done these for almost every major ARVN unit, and a few US units. Once you see these in person or feel the paper they are printed on, you will know right away they are not vintage. 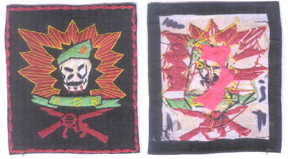 Here they are, the scourge of Ebay and gun shows, the supposed original VC / NVA battle flags. No matter what story the seller swears by, these are not real. Once you have handled or seen a real VC / NVA regimental flag, you will know instantly these are bad. Plus the fact that a real regimental is worth big bucks, not $20.00 or a Buy-It-Now offer of under $100.00. Plus, sellers do not have large quantities of these, if they are real. The majority of the ones in the military museums, in Vietnam, are not real either.If you want a semi-cool wall hanger these are fine, but they are not original. Some more fantasy pieces that are constantly offered on Ebay and internet websites. 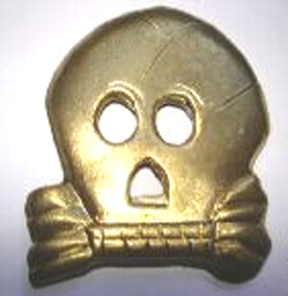 For the shear number of these that turn up, you would think that every GI in Vietnam brought one of these home. There were not 100's of Ranger units flags made during wartime. Let alone all the SOG, PRU, Mike Force, etc, or other elite unit wall hangers. Originals are rare, and are very prized by the veteran's themselves and by collectors. If these were real the seller's would not have quantities of each unit like they do. Vietnam Zippos are another mine field of collecting. This photo was taken in Saigon /HCM City, in the early 90's. Even then 95% of them were freshly engraved and aged. 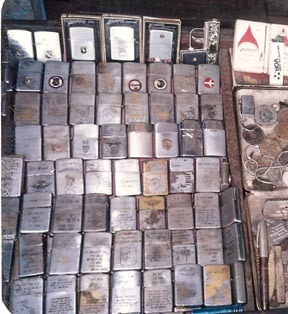 The two books out there on Vietnam Zippo lighters, do nothing to help collectors, as the vast majority of lighters shown are fakes. I am sure the authors believe they are real, but only because a very good "Snake-Oil Salesman" convinced them they were original. This is another area that once you see a real engraved VN Zippo, the fakes look nothing like them. Forward Observation Base SOG Shell burst pocket Patch. This is another one sold by the same seller as the above. The quality and stitch work is almost perfect. The seller even glued the patch to paper to make it look like it had been removed from a album. The one problem with the paper is that it is a post-it note. On one of the other patches that was sold to our friends it had two perfect corners on it, even though it was supposedly removed from an album. 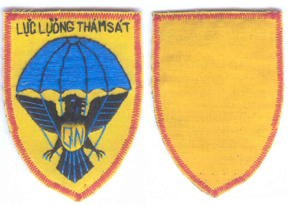 South Vietnamese LDNN SEALS patch. Another dangerous reproduction from the same seller as the above ones. Please pay close attention to these and see the time and trouble that fakers will go through just to make a extra dollar from unsuspecting collectors. 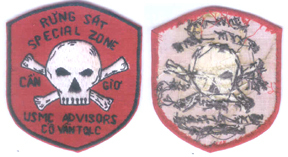 US Marine Corps Advisors To The Rung Sat Special Zone Patch. This is one of our favorites. Incredible attention to details. There are two major mistakes on this one. One is the backing material is way to stiff and coarse. The other is the only real examples of these we have ever seen have been printed, so you can image when a collector sees a fake this perfect they are going to jump on them as that rare variation. South Vietnamese Qhuin Non Provisional Recon Unit Patch. Again from the same dealer as the above. This one is by far the most dangerous of these ones. The hand embroidery, the border stitch, the backing material, everything. The only set off on this one is the thread is wrong. It is the wrong construction for late 60's - early 70's. The threads consistency is very coarse and all synthetic to the point where you can feel the flaws in it. Recon Team Wasp pocket patch. Well where to start with this one. Again, made by the same person as the above and sold by the same seller. The one major point is, we have never seen a real RT Wasp. 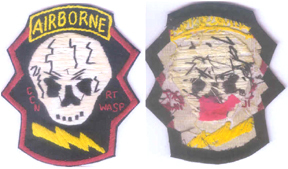 We have seen many dangerous fakes, not as good as this one, but have never seen a documented wasp patch that was real. We don't want the collectors to think this person only had Special Forces unit patches made. He had USAF units, ARVN units, USMC advisory units, jump wings, scuba tank dive qualification patches, ranger qualifications, airborne artillery qualification patches, etc. In most case they used real tiger stripe, SVN Ranger camo & ERDL material scraps to use as backgrounds. In this group that he sold there was every major rare patch, and in the case of the two collectors in California, they sold them each the exact same set of patches. Of all the patches we have on this page this and the above six, are extremely hard to tell if they are original, and were made only to screw collectors out of hard earned money. 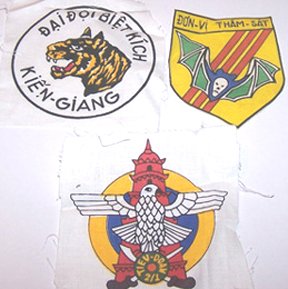 Printed South Vietnamese unit patches. This is one of the tricky areas of Vietnam patch collecting, as the remakes are made almost identical to the originals. These that are shown were made in the early to mid 80's and were sold with numerous designs all on one printed thin cotton sheet. They were sold through the Aiverex Company's catalog " THE COCKPIT". Within a couple of years they were all cut off the sheets and being sold as originals. One of the easiest ways to spot these is to hold them up to any light source and they are almost transparent. If you have ever wondered why the same handful of patches are always showing up, this is why. Cast and stamped beret and breast badges. Like the above these are also sold in the War Market in Saigon today and for about the last ten years. They are the basic designs of the original pieces but are new. Most have a brass worn finish to them and some are now being plated over there to look better. Unlike the originals these are very flimsy and can easily be bent with your hands as they feel almost like a soft lead when you bend them. 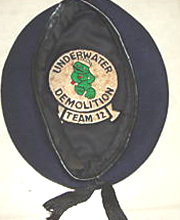 The LLDB1st pattern beret badge, the originals are pinback. 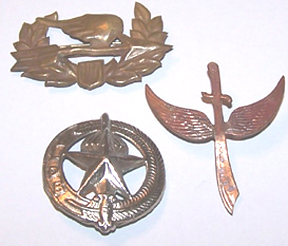 Most all the fake beret insignia you see coming out of Vietnam now, all have the British / French style two loops on the back for a pin to go through. The originals did not have this. Again these are all over the internet with dealers swearing how real they are. 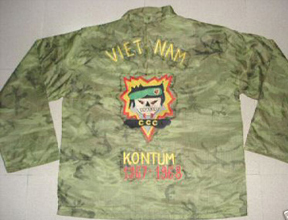 This one is a example of some of the fake tour jackets being made in Vietnam today. The first set off is almost all the jackets are elite units, and with those elite units are only the designs for the patches that are in books. The next set-off is the stitching. This is done way too tight for wartime Vietnamese hand embroidery. The most blatant set-off should be the jacket itself. That pattern poncho liner wasn't even made during Vietnam. The colors, stitching, etc.., it is all wrong.